ITV | Did You Watch It? ITV…Utopia. Mandela may be dead but Apartheid is still alive…In Australia. Nieghbours, Bondi beach, Sydney Opera House, the lucky country,an easy going straight talking people. This is the image most of the world has of Australia. Behind this sunny facade lies a very dark secret, a secret that most Australians profess to be unaware of. The secret is the shocking treatment of Australia’s indigenous population. John Pilger, an Australian born-journalist, who has lived for many years in the United Kingdom returned to the country of his birth to film this documentary on the treatment of Australia’s first peoples. It was a hard hitting documentary, and an unusual but welcome scheduling on ITV1 where documentaries are increasingly a very rare sight. The title of the programme intentionally serves to highlight the glaring inequalities that exists in Australia. Taking it’s name from the town of Utopia, a poor desolate township inhabited by indigenous Australians, bereft of almost any of the facilities we take for granted in the rest of the developed world. The name is like a never ending cruel joke reinforced by the fact that the government appointed white district commissioner despite living in a smallish bungalow enjoys a staggering 18 air-conditioners while the residents of Utopia have no electricity. In the documentary Pilger interviewed a range of Government officials on the situation with the indigenous peoples, officials who had a direct responsibility for enacting change that had been promised for decades but not delivered, the responses he got were a master class in willful negligence. In one particular interview a prison official was questioned about what changes she planned to enact after an indigenous Australian was arrested and left in the police van in the middle of the scorching desert sunshine. The coroners verdict was that he slowly roasted to death. No one was arrested and the prison official proudly told Pilger how she has to sent her officers “cultural awareness training” in the aftermath. We were taken to the Island of Rottnest, today home to a multi million tourist resort and spa. This has been built on the site of one of Australia’s largest indigenous Australian penal colonies, a colony that saw hundreds of prisoners perish due to the brutal conditions. Building a hotel, effectively cementing over the island’s brutal past, is equivalent in terms of sensitivity to say turning Auschwitz or Belsen into a tourist resort. We are told how the how the the life expectancy of the average indigenous Australian is far less that his white compatriot with a third not living beyond 45. We are told how in the Northern Territories prisons are being built to solely incarcerate indigenous Australians. We are told how the Northern Territory imprisons indigenous Australian at a rate six times greater than that of black people during the days of apartheid in South Africa. We see evidence of how the Australian government and press conspired to paint a picture of widespread child abuse having occurred in some communities, suspended civil rights and proceed to arrest many adults and remove their children, a scandal which was ultimately exposed as a cover for a land grab. In all a picture was painted of at best a very dysfunctional relationship between a government and a people it should serve in the way it serves others, and at worst a brutal systematic purposeful campaign that may lead to the extinction of an ancient people. If there was a problem with the documentary, it was too long, and there was a lot of sermonizing, the facts of the situation on their own were screaming out the message that needed to be told. If you missed it you can catchup on ITV Player. ITV…Is The X-Factor in danger of becoming The Ex-Factor? When The X Factor first hit our screens way back in 2004 the world was a different place, “twerking” and “selfies” were unknown to the masses, Facebook had just been invented and pretty much no one outside her family and friends had heard of Nicole Scherzinger. With its ability to create instant success and celebrity, its unashamed and relentless use of the “sob story” to try to create emotional connections with the contestants, and the unleashing of Simon Cowell’s pantomime Mr Nasty persona, the basis for a Saturday night blockbuster were laid. The first few series achieved good, but not sensational ratings , it still needed something extra, a winner that could step out of the shadow of the show to become a credible artist in their own right. In 2006 the show hit jackpot when it discovered London receptionist, Leona Lewis , who went on to wow the X-Factor audience, the nation and the world. The X-Factor had produced the global star it desperately wanted. This also proved to be the fillip needed to create a breakout in ratings for the show as it went from strength to strength trashing all comers in the TV ratings battle. So dominant was the show between 2007 and 2011, that for many Saturday night became simply The X-factor night. The peak of the show in audience figures terms, but not necessarily in quality, was the Matt Cardle’s triumph in 2010 where the final show saw a TV audience of 19.4 million, a staggering 30% of the UK’s entire population, tuning in. Those were the glory days, since then by its own very high targets the show has waned, changes to the show’s format, and tinkering with the judges and contestant selection has failed to stop the drift. While it still pulls in an average of 9.57 million people each week, a figure that would make any other show on UK TV envious, it is failing to fulfill its reason for existence, to dominate prime time Saturday night TV. This year’s final featuring prison office and favourite to win, Sam Bailey , dreadlocked west country singer Luke Friend and the petite Nicholas McDonald are a trio that would probably be loved by grand-mums and grand-dads across the nation, but being one of the plainest set of finalist ever they are unlikely to reverse the declining trend. ITV’s contract allows for three more series but it remains to be seen whether the show has enough steam to last that long. Ant and Dec together with ITV are taking the successful primetime Saturday night entertainment show “Saturday Night Takeaway “on tour around the country for their next series. The tour starts in Cardiff on the 6th of August and runs through to the 12th of September when it ends at London’s Wembley Arena. If you fancy being part of the show tickets are now available for the following dates and venues. 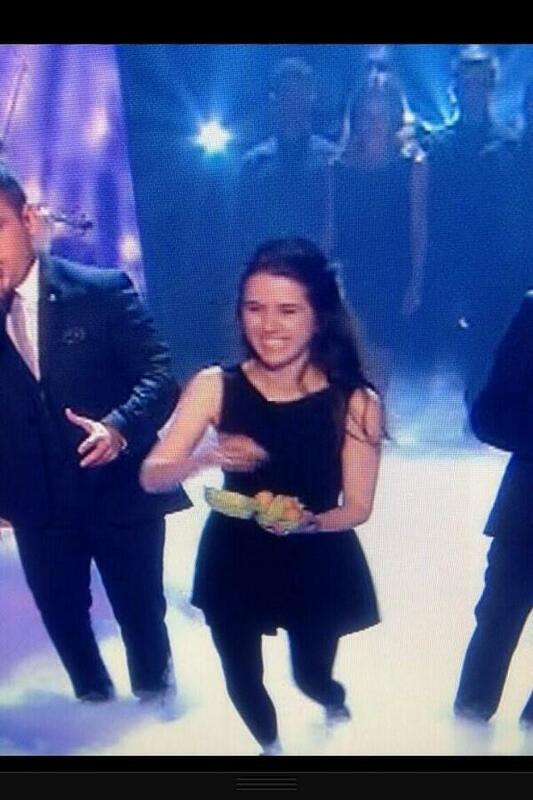 Britain’s Got Talent Final…Simon Cowell gets egg-ed by woman. Britian’s Got Talent had an unexpected entrant in the final this evening. Blink and you would have missed it but during the performance by the classical music duo Richard and Adam Johnson a woman who it seemed was part of the orchestra left her position strolled up to the front of the stage with what seemed to be a pack of Sainsbury’s woodrange free range eggs and let fly. Britain’s Got Talent…but is it new or even original? Last night the latest variant of the vaudeville acts we get from Simon Cowell‘s pipeline hit ITV last night. Britain’s Got Talent is back. As usual we fed the good, the bad, the ugly and the downright weird (yes Mr Vicar with a nun on a broom stick, that was weird). I guess from the producers point of view and also the crowd reaction one of the sensations of the night was the dance troupe from Hungary – Attraction with their innovative and unusual approach to dance, but was it unusual or that innovative? There are in their own right two great performances but I think the for me the problem with Shadow dancing is once you’ve seen it once, it loses its awe. Or am I being too much of variety show snob? They say Nostalgia is always better the first time around. Sometimes it isn’t. I remember 1994 and I certainly remember PJ and Duncan and their hit single Lets’ Get Ready To Rhumble. It is safe to say my CD Rack feeble as it was back then was never remotely threatened by its addition. Roll forward nineteen years. PJ and Duncan have become Ant and Dec. The Geordie lads from Byker Grove have become a pair of, not yet middle aged but certainly get closer, Saturday night Entertainers far removed from their suburban “Hip-Pop” roots. As they evolved they carefully managed the change of their brand leaving behind all the vestiges of what they once were, that is until tonight. In a nod to a recent reality TV series on ITV2 that saw 5ive, Blue and Atomic Kitten reforming, these bands were invited to perform on the Saturday Night Takeway tonight and the surprise was for one night only Ant and Dec were going to perform their hit single alongside the other bands. The song might have been cheesy, pop-pish and very Vanilla but the performance Ant and Dec gave tells you everything you need to know about why they are Mr & Mr Saturday night TV. It was stupendously fantastic, especially when you consider that they were busting these same extremely energetic moves close to twenty years ago. I shouldn’t have liked it but I loved it. ITV’s Ant and Dec’s Saturday Takeaway…My kids are in Paris???? Ant and Dec are British TVs most wholesome double act, so wholesome that they probably count as one of your five a day and ITV’s Saturday night line up is not complete without the dynamic Geordie duo turning up in some guise or the other. The latest offering is a new series of their successful Saturday Takeaway a mix of prize giveaways, celebrity appearances, competitions and surprises for the audience. Nothing controversial and as I said all very wholesome. Sometime even the most wholesome show hits a “this is a bit awkward” moment. A young lady was picked out of the audience and Ant and Dec explained how the Mothers Day spa trip her two daughters organised for her was far from ordinary. In disguise were quite a few of her favourite celebrities. Clips from the visit revealed to her that the receptionist at the spa was Olympic medallist Louise Smith, her chef was Dancing On Ice Judge Jason Gardner and the swimming pool attendant was TOWIE‘s Mark Wright. Each clip bringing lots of audience laughter and humorous surprise from the mum. All fine and normal, it then moved onto her chance to win a prize – ” A trip to Paris”. The camera cut to her daughters who we were told were in Chesterfield as they read out three clues for their mum ”Where do they say bonjour?”, “Where is the Eiffel Tower?” and “Where do they wear berets?”. Mum answered the questions and won the prize and then the real surprise she was told she was off to Paris “to join her kids”. Then her expression changed she was no longer amused more bemused. You did not have to be a mind reading to see the thoughts racing through her head. What the h@#! were her 7 and 4-year-old daughters doing in Paris? How did they get there? Who was with them? She was literally frozen to the spot with incredulity and not of the happy kind, and had to be subtly ushered off the stage. I suspect there are going to be many questions asked back stage. It deem seem a bit gung ho, I not sure if there was another parent present but there had been no suggestion on the show that there was, so I can imagine the mum being less than happy. I think Ant and Dec may have dropped a tiny notch on the wholesomeness scale. This was quite a revealing in-depth documentary about Prisoners in HMP Aylesbury. What really caught my attention was the case of a young lad Ryan Buckley. I didn’t catch what offence he had committed but his storyline was pretty harrowing and my first thoughts were how come these scenes were being shown on TV. Ryan clearly had serious psychological issues. We were shown scenes of him self harming and worse his body being taken down after an attempted suicide. As a prisoner Ryan rightly has many rights taken away but does that include the right to decide if his struggles in prison is allowed to be used for our “edutainment“? He may have willingly agreed to take part in the programme but is he really in a state to give informed consent. I can imagine if he has people outside that care for him watching his unconscious body being cut down from a noose where he tried to hang himself must be heart breaking. Prisons are for punishment and where possible rehabilitation. “Edutainment” which I am sure is what it is being sold as, is not within the remit of the Prison Service and programmes like this take us down a road we may not want to travel on. ITV…Did the Brits just invent a new award for One Direction? The Brits is pretty much what you expect a host of stars, starlets, luvvies, media types, the full A to Z of celebrity. Then you have the those they all came to see and be seen with the Brit nominees and the winners. It was a good night for Emili Sande taking home the Brit award for British Solo Female Artist of the years and album of the year. Other artistes who won were Ben Howard (Best British Breakthrough and Male Solo Artist), Lana Del Rey (Best International Female), Frankie Ocean (Best International Male), Black Keys (Best International Group) and Adele received her award over in America for Best Single. Pretty much all the usual suspects picking up awards except that is for uber-boy band of the moment One Direction. Host James Corden spent a lot of the programme talking about them and mingling with them. When Talyor Swift made an appearance it did not take long for James Corden to head over to join them (well Harry Styles). A beaming open shirted Simon Cowell was close by, keeping an eye on his money spinning wards. Generally they were the focus of a lot of attention. Surely with all this focus they must be here to pick up an award, but as the awards were handed out one by one it looked like they were heading home empty handed. That was until out came Robbie Williams waddling up to the satge in a suit that fitted very snugly over what looks like the beginning of a very ample belly. He announced the winners of the ‘Brit Award for Global Success’ and the winner? Yes One Direction. What? Where did that come from you might say? ’Brit Award for Global Success’ where was that when Blur, Oasis, Cold Play and others were sweeping the world before. Who knows but maybe in the minds of some these other artistes aren’t as ground breaking as One Direction. The lesson it seems is if the fans, and critics don’t want to show any love for One Direction, the Brits awards committee will.